MICHIGAN TRUTH SQUAD ANALYSIS: "Meet the Parents"
Questionable statement: "How about that Debbie Stabenow? Never met a tax increase she didn’t like … worst senator Michigan has ever had. " These are broad generalizations, including a personal attack on Stabenow, that the video and a related campaign website don’t fill in. 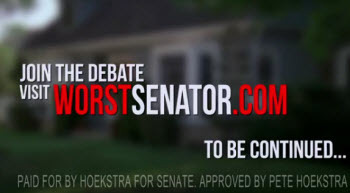 It is difficult, of course, to provide lists of votes and policy details in a two-minute video, but the Hoekstra campaign chose not to include such details on the accompanying website – a rather odd omission. Questionable statement: "Can’t really say I agree with you Mr. C. I think what makes Stabenow the worst senator we’ve ever had is her wasteful spending. And that’s something that our generation is going to have to pay for. " Once again this claim is not supported with any examples of Stabenow’s "wasteful spending." However, it is fair to say that the large federal debt is a burden on the current generation of young people and possibly future generations. This month, the federal debt level passed the $16 trillion mark. In June, the Congressional Budget Office estimated that the federal debt would reach 73 percent of Gross Domestic Product by the end of the year, the highest level since the late 1940s. Questionable statement: "Well Ryan, I got one word for you: Obamacare. One of the biggest tax increases in history, and Stabenow was the key vote. " Factcheck.org found that the Affordable Care Act, known as Obamacare, could be the biggest tax increase in terms of raw dollars (not adjusted for inflation). But it found that others since 1968 were larger as percentages of the GDP. Stabenow was a strong proponent of the Affordable Care Act and was one of 60 senators, all Democrats, to vote in favor of it. Thirty-nine of then-40 Republican senators voted against it. Rep. Jim Bunning of Kentucky did not vote. Questionable statement: "Well I have one word for you sir: stimulus. She voted to spend $800 billion and it didn’t really stimulate anything." There has been much debate over whether the federal stimulus program, formally known as the American Recovery and Reinvestment Act, worked. Republicans have hotly criticized the program, and even Democrats shy away from saying "stimulus." But a 2011 Congressional Budget Office report estimates the stimulus act will add between 0.3 percent and 0.8 percent to GDP and will be responsible for the creation of between 400,000 and 1.1 million jobs this year. Questionable statement: "Stabenow got an ‘F’ from the National Taxpayers Union." No surprise there. The National Taxpayers Union is a small-government, low-tax advocate that bills itself as nonpartisan. Generally, though, NTU’s higher ratings have gone to conservative Republicans. Questionable statement: "She also got one of the lowest ratings from Citizens Against Government Waste." Citizens Against Government Waste, founded in 1984 by industrialist J. Peter Grace and journalist Jack Anderson, says it is "dedicated to eliminating waste, fraud, abuse and mismanagement in government." Of course, "waste" and "abuse" are flexible terms. In 2010, for example, CAGW used votes on increasing the federal debt limit and changes to campaign finance regulations, among others, to rate members of Congress. That year, CAGW gave Stabenow a 2 percent and "hostile" rating, while judging her opponent, Pete Hoekstra, at 100 percent and a "superhero." Citizens Against Government Waste gave Stabenow its "Porker of the Month" award in March for sponsoring a failed amendment that would have extended federal subsidies for green energy. Questionable statement: "She voted against a middle-class tax cut that directly affects my take-home pay … Over 70,000 earmarks … Death tax." Neither the video nor the website report what middle-class tax cut Stabenow voted against. In July, Stabenow voted for a Senate bill that would extend the Bush-era tax cuts for those making up to $250,000 a year. Neither the video nor the website cite a source in claiming Stabenow voted for more than 70,000 earmarks. She sponsored or co-sponsored 663 earmarks from 2008 to 2010, the latest year available, according to the Center for Responsive Politics. Earmarks are funds provided by Congress for projects, programs and grants, often in the districts of lawmakers requesting them. In July, Stabenow voted for a plan by Senate Majority Leader Harry Reid, D-Nev., calling for the expiration of current rules on federal estate taxes, which Republicans like to call the death tax. If those rules expire on Dec. 31, tax rates on estates worth more than $1 million will rise. Questionable statement: "She voted to raise the debt limit over and over and over." Votes on raising the debt limit were routinely approved in Congress until last year, when Republicans and Democrats deadlocked over the measure, nearly causing the nation to default on its debt. Hoekstra also voted to raise the debt limit a number of times while serving in Congress. He was attacked for those votes by Clark Durant, his primary opponent in the Senate race, and by his Republican rivals in the 2010 gubernatorial race. Questionable statement: "Ryan, daddy, that’s enough … it’s Stabenow’s failure on jobs that makes her the worst senator." Neither the video nor the website explains the details on her "failure" on jobs. In the last 29 months, when her Democratic Party controlled the Senate and White House, 4.5 million private-sector jobs have been created, according to the White House. The claim was judged "mostly true" by Politifact. However, job growth has been weak since the end of the Great Recession. Stabenow became a member of Congress in January 1997 and a member of the Senate in January 2001. In that time, the U.S. business cycle suffered two contractions totaling 26 months, out of a possible 188 months to date. Hoekstra served in the U.S. House from January 1993 through December 2010. In that time, the U.S. business cycle suffered two contractions totaling 26 months, out of a possible 216 months. Overall impression: The video includes a number of iffy statements, such as the stimulus act "didn’t really stimulate anything." And neither the video nor the website provide detailed data on Stabenow’s record to support various conclusions. The claim that Stabenow is the worst senator in Michigan’s history is an opinion that constitutes an ad hominem attack. Foul or no foul: Foul. The problem is more with what’s missing from the ad and website than what’s in them. Stabenow did vote for the Affordable Care Act. She has voted for federal debt limit increases, as did Hoekstra and plenty of other members of Congress. During her service in Congress, the economy has fallen – and risen. The National Taxpayers Union and Citizens Against Government Waste are not fans of Stabenow’s record. But the CBO says the stimulus bill is adding to GDP – hardly a case of it not stimulating anything. The 70,000 earmark figure is large, but where’s the citation for it? Without citation, it's a claim, not a fact. "Wasteful spending" – by what measure? And how does one factually define who is, or isn’t, the "worst" senator? The claims outrun the facts. Foul! right! not the worst....what about Levin? So as not to get a "foul" myself: The explanation for this "generality" is that Levin has been toeing the democrat line a lot longer. That includes supporting liberal/socialist bills like Obamacare. That atrocity cancels any good he's been able to accomplish in defense or in Michigan earmarks. But under your standards what political claim stands up? Very few, becuase they aren't mean to to reach you. But are you as vigorous when examining Debbe's claims on what she's accomplished. Let's just leave the question at , Are we better off as a nation since we've sent DD or Levin to Washington? Under that question they're both loosers. All they've done is turned us to a near bankrupt nation of takers.